Builders are correct to be cautious about loft flooring because, if done poorly, damp problems can arise. Not only that, but even a damp problem which is caused by the builder’s negligence could be hard for you to defend if your loft flooring hasn’t allowed adequate ventilation to the insulation. The good news is that if you fit the flooring correctly, with a system which allows a gap for airflow above the insulation, then you can actually floor almost all of your loft. This is often in the region of 40-50m2. LoftZone recommends that a gap of approximately half a metre be left between the edges of the flooring platform and the roof. 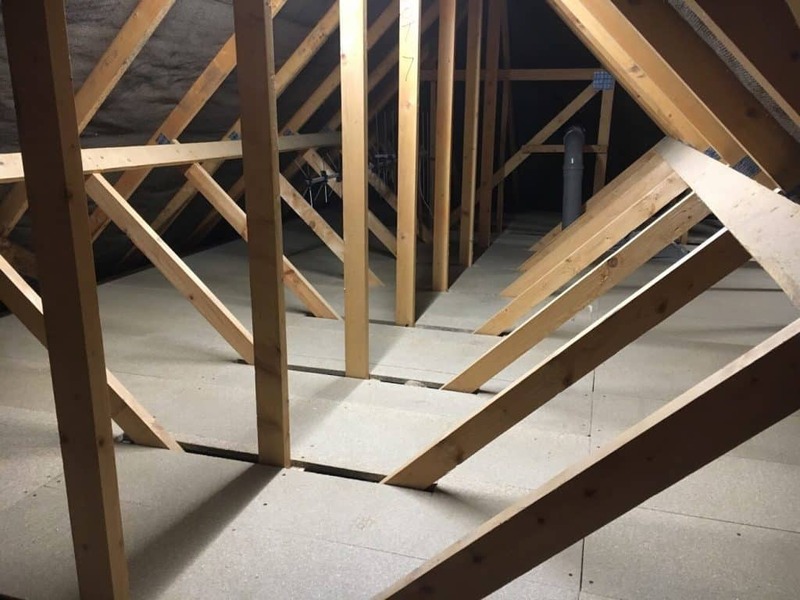 Since LoftZone allows good airflow across the joists and not just in line with them like traditional methods, flooring can usually be fitted snug up to the gable walls as long as there are gaps down the other sides. Since we quote per m2, we advise that flooring the middle section gives the best ‘bang for your buck’. Most new builds have a ‘fink’ (or ‘W’-shaped) trussed rafter design, where the middle area lines up with the peak of the roofline and therefore has the most headroom. This is an important factor when considering the raised flooring will reduce the headroom by about 1ft. That being said, once the eaves sections are floored too then the gaps in the trusses make great storage locations and allow the middle area to kept more clear for an access way. If you have an irregular loft layout then one of our surveyors would be happy to discuss the various options with you during a free survey.